DO: educate yourself about renting in BC. Read this Tenant Survival Guide and complete TRAC’s online course, Renting It Right. DO NOT: forget that by signing a tenancy agreement you are entering into a legal contract. Protect yourself by learning about your rights and responsibilities under the Residential Tenancy Act. 2 Are you covered by the law? If you pay rent for your home, you are most likely protected by the Residential Tenancy Act (RTA) – the law that outlines tenants’ and landlords’ rights and responsibilities. The RTA is a provincial law that applies only to British Columbia (BC). If you have rented in other provinces or countries, do not assume that the same rules apply. 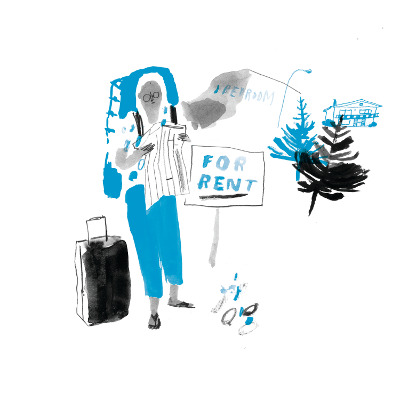 After reading this Tenant Survival Guide, you may be surprised at how BC’s tenancy laws differ from tenancy laws around the world. One of the most important things to understand about the RTA is that it cannot be avoided. All tenants are guaranteed certain legal rights by law, regardless of what their tenancy agreement says. According to section 5 of the RTA, any term of an agreement that “contracts out” of the RTA is considered unenforceable. If your landlord tries to unfairly reduce your rights in this way, contact the Tenant Resource & Advisory Centre (TRAC) or the Residential Tenancy Branch (RTB) for more information. Policy Guidelines on key topics. Are you covered by the law? When renting a home in BC, you want to be covered by the Residential Tenancy Act (RTA). If the RTA does not apply to your living situation, you will still have certain rights under common law, but they will be less clear and harder to enforce. The Tenant Resource & Advisory Centre (TRAC) and Residential Tenancy Branch (RTB) can only provide legal assistance to tenants and landlords protected by the RTA. accommodation, if designated under the Mental Health Act, in a Provincial mental health facility, an observation unit, or a psychiatric unit. If the RTA does not cover your living situation, you will not be able to apply for dispute resolution through the RTB. Instead, you may need to use Small Claims Court, the Civil Resolution Tribunal, or BC Supreme Court. Occupants / Roommates: There is another living situation that may not be covered by the RTA, but is also not mentioned in section 4. If you rent from a tenant with whom you live, you may not be protected. This type of setup is common in shared houses where a “head-tenant” rents out a room to a roommate. Unless the landlord agrees to add the new roommate as a “tenant”, that person will most likely be considered an “occupant/roommate” and not be covered under the RTA. See RTB Policy Guideline 19 for more information. If you currently rent a room from a tenant with whom you live, consider speaking to their landlord about being added to your roommate’s tenancy as a “co-tenant”, or signing a separate agreement. If that is not possible, you and the tenant to whom you pay rent can consider signing a contract that outlines the rules you both agree to follow. This will offer some legal protection, even though your situation is not covered by the RTA. Manufactured (Mobile) Homes: Manufactured Home Park Tenancies, also known as mobile home tenancies, may or may not be covered by the RTA. If you own a mobile home and rent the land it sits on, your tenancy falls under the Manufactured Home Park Tenancy Act (MHPTA). However, if you rent a mobile home within a manufactured home park, your tenancy falls under the RTA. As long as you are covered by either the RTA or MHPTA, you can access the RTB’s resources, including dispute resolution. The good news is that most rental housing in BC is protected by the Residential Tenancy Act (RTA). Tenants most commonly live in apartment buildings or rented houses, including secondary suites, but the RTA can apply to other types of housing too. Rented co-op units, hotel tenancies, illegal secondary suites, rental units on “lands reserved for Indians”, strata buildings (condos or townhomes), subsidized housing, and verbal tenancies can all be covered by the RTA, to varying degrees. These types of tenancies may involve additional laws and governing bodies and can present complex scenarios for tenants and landlords. Cooperative Housing: The RTA does not apply to accommodation rented by a housing cooperative, or “co-op”, to a member of the cooperative. However, if you rent from a member of a co-op, and are not a member yourself, you will most likely be protected by the RTA. Hotels and Single Room Occupancies (SROs): Hotels are covered by the RTA, if a tenancy has been established and the property is the tenant’s primary and permanent home. You have probably heard of a specific type of hotel known as a Single Room Occupancy Hotel, or “SRO”. These are commonly found in Vancouver’s Downtown Eastside and provide short-term or long-term housing to low income tenants. Like standard hotels, SROs are covered under the RTA, if there is a tenancy agreement in place and the property is the tenant’s primary and permanent home. See RTB Policy Guideline 27 for more information. Illegal Secondary Suites: A secondary suite could be a basement suite, laneway house, or other unit that is on the same property as a residential house. If a secondary suite does not comply with zoning and bylaw requirements, or has not been registered with the City, it may be considered an “illegal suite”. The most important thing to remember about illegal suites is that they are covered by the RTA. That being said, it is not ideal to be living in one, as your housing could be at risk if your City finds out about the suite. This can sometimes happen if a dispute with a neighbour turns into a complaint to the City, or if you go to the City seeking help with repair or maintenance concerns. When a City discovers an illegal suite, they may decide to shut it down. If this is the case, you will be given a One Month Eviction Notice for Cause under section 47(1)(k) of the RTA and your landlord will most likely not be responsible for paying any of your moving expenses. Rentals on “Lands Reserved for Indians”: If you are renting a home on “lands reserved for Indians” (Reserve Lands) as defined by section 91(24) of the Constitution Act, the RTA may partially apply. Any disputes over use and possession of Reserve Lands, such as eviction, fall under the authority of the Federal Government – not the provincial RTB. However, the RTA may apply to a situation involving a monetary claim, such as the return of a security deposit, but only if the landlord is not an Indian or Indian Band, as defined by the Indian Act. See RTB Policy Guideline 27 for more information. Strata Buildings (Condos or Townhomes): In strata buildings, owners own individual units but share ownership of the common space. When you rent a strata property from an owner, you are covered by both the RTA and Strata Property Act (SPA). All strata buildings have a set of bylaws and rules that owners and tenants must follow. When entering into a tenancy, your landlord should have you sign a "Form K", which indicates that you have been notified of the current bylaws and rules. Even though you are not an owner, you may still be subject to fines or fees. For example, you might have to pay fees when moving in and moving out according to section 7(f) of the Residential Tenancy Regulation, or you may have to pay fines levied by the strata corporation if you disturb neighbours or damage property according to section 131 of the SPA. A strata corporation can also try to evict a tenant under section 138 of the SPA by serving a One Month Notice for Cause under section 47 of the RTA. However, even though this section exists in the SPA, the RTB has been known to deny jurisdiction in such cases at dispute resolution, claiming that a strata corporation does not fit the definition of “landlord” in section 1 of the RTA. This is a grey area of the law where the SPA and RTA somewhat contradict each other. If you receive an eviction notice from a strata corporation, the safest action is to not ignore it. Instead, apply for dispute resolution and allow an arbitrator to rule on the matter. Public housing: a government department, BC Housing, manages rental units for low-income families, seniors, and people with disabilities. Non-profit housing: non-profit organizations receive government money to manage subsidized rental units for tenants throughout the province. Shelter Aid for Elderly Renters (SAFER) – cash assistance for eligible BC residents who are age 60 or over and pay rent for their homes. Verbal Tenancies: Although section 13 of the RTA requires landlords to prepare tenancy agreements in writing, section 1 of the RTA also says that a tenancy agreement can be “oral, express or implied”. This means that you do not have to sign a written agreement to establish a tenancy. Despite the fact that verbal tenancies are covered by the RTA, it is still always best to have a written agreement with your landlord. It is important to understand the difference between the terms “owner”, “landlord”, and “agent”. All tenancies under the Residential Tenancy Act (RTA) have an owner who is automatically considered a landlord. In addition, some tenancies will include agents acting as secondary landlords on behalf of the owner. For example, if you rent a unit in a large apartment building, there is a good chance the owner will hire a property management company to manage the building. In this situation, the owner and the property management company, acting as the owner’s agent, are considered your landlords. This means that if you have any problems during your tenancy, you can list both of them on an application for dispute resolution. See section 1 of the RTA for more information. This page was last edited on 10 January 2019, at 13:01.